This product is not worth your time, money, or hassle. It's cheaply and poorly made and WILL break over time. The idea is wonderful, and I think if it were made stronger, it would be a hit! I'd like to see the company make some changes and put out a higher quality heart tray. I can't recommend this product to anyone, unless you're hoping to be disappointed and have to deal with returning it. Thin plastic, easily breaks, doesn't have a spill proof rim. I was so excited when I saw this heart shaped ice cube tray by California Exotics. It was on my wishlist for a while and I finally caved in and got it. It was affordable and I thought it would be an excellent option to have in my house, whether it was for temperature play, adult drinks, or to even put in my daughters' glasses of water. The idea is dead on. Who wouldn't want sweet little hearts in your drink instead of the same old cubes? I sure did! 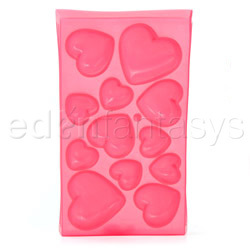 This pink, heart tray is 7" long and 4" wide and is made of a very thin smooth plastic. You're able to produce two large hearts, four medium hears, and six small hearts each time you fill and freeze it. The top of this tray is totally smooth with no rim around the border, making it almost impossible to not spill the water on your way to the freezer. It comes in a bag with a cardboard header that has a lady on it wearing a red dress, carrying a tray of drinks. There's nothing inappropriate about the packaging. I didn't notice a smell when I took it out of the package, but I wasn't trying hard to smell it either. I would recommend hand washing before the first use, and as needed. It says dishwasher safe, but I find that hard to believe. The plastic is food-grade material, hypo-allergenic, latex free, and phthalates free; as stated here on EdenFantasys. I don't believe that there's any concern about the safety of this plastic for it's intended use. This seems like it would be great for party treats, using it for ice as well as a candy or jello shot mold. It would probably take a while though, as you could only make 12 hearts at a time. I'm extremely disappointed in this product. As soon as I took it out of the package I saw that there was a large weak spot going down the middle of the plastic tray. I decided that I would give it a go once to see if it would hold up. I washed my tray, made the ice, and when I tried to get the cubes out, I could tell that it was going to break if I tried. So, I ran hot water over the ice and decided not to even try it. I returned this tray because though it's a great idea, it's very poorly made. EdenFantasys was amazing about refunding me for my purchase, so I'm satisfied with that, just not with this tray. thanks for the review. too bad it didn't work out. I am glad you got a refund. Thanks for an honest review.